High-performance power protection specialist Piller, saw an increased attendance at its 2018 International Power & Conditioning Symposium (IPCS), the fourth hosted by the group. The event which took place on 3rd to 6th June 2018 near Hannover, Germany, attracted over 130 international delegates from the world’s data centre and manufacturing industries. The event commenced with a welcome speech from Piller Global Managing Director Andrew Dyke who said the symposium had been designed in part, as an opportunity to explore the implications of Industry 4.0 upon the data centre industry as a whole and ways we can respond to the many challenges it presents. He also touched upon the need to process ever larger amounts of data in the Cloud with its effect on future data centre architecture and on our priorities as providers where scalability and total cost of ownership are more important drivers than ever before. All indications are that the World is moving to a future where increasingly, software applications for industry and life will spread workloads between enterprise, private and public cloud facilities. The pressure that increasing data management and analytics has placed on the Internet has been answered in part by the advent of Edge Computing, but while the act of processing data close to its source is vastly more efficient for some applications, it will still require the huge connectivity offered by the Cloud and the ever-increasing capacity of Hyperscale data centres. Industry expert speakers from ten companies presented different sessions including ‘Challenges facing Hyperscale data centre construction’, ‘Case Study - Implementing a scalable IP Bus system’; ‘Case Study - The world’s first Tier IV Certified Design and Construct Facility without 2N UPS.’; ‘Case Study - Real Optimisation of Data Hall and Powerhouse Cooling’ and ‘Cooling Trends in Hyperscale Facilities’. Delegates also travelled to Piller’s principal manufacturing site, with part of one day dedicated to a tour of the Osterode manufacturing facilities. 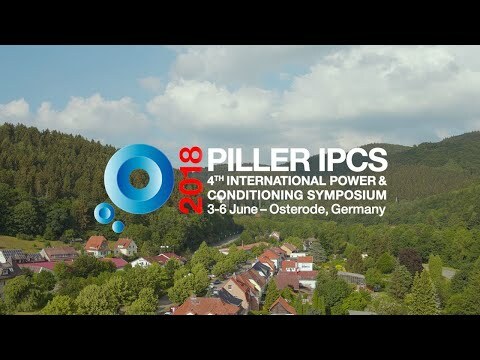 Demonstrations of Piller’s latest power conditioning solutions were held in the test centre which included Piller’s CPM 300/360 - the world’s first UPS to incorporate double conversion and line interactive protection with an integrated extended run-time flywheel backup; the highly efficient battery alternative - 1 minute, 1MW PB60+ flywheel and the new Active Power CleanSource® XT MMS (Extended ride-through Modular UPS System). Delegates were shown the ease and confidence with which multiple standard diesel generating sets, using standard random access paralleling, can be run up, paralleled and loaded repeatedly within less than 15 seconds. To conclude the proceedings, an independent expert panel of seven debated current data centre techniques and whether a step change is inevitable to keep pace with the explosion of data. In his summary speech Andrew Dyke commented that the data centre designer needs now to be thinking more than ever about how to be more energy efficient in order to help offset the exponential growth in automation, drones, smart factories and the IOT in general. He also remarked, reinforcing the comments of one speaker, that we have a moral responsibility to build the Cloud and the IOT in the right way given that our actions today will present a legacy for generations to come. After the conference close, pre-registered delegates were also able to visit a state-of-the-art data centre facility. Piller Global MD, Andrew Dyke, thanks the independent expert panel who were debating current data centre techniques followed by a lively and interesting Q&A session.